The Services are not directed toward children under 16 years of age nor does InLinkUK knowingly collect information from children under 16. If you are under 16 years of age, you are not permitted to submit any personal data to InLinkUK. If a parent or guardian becomes aware that his or her child below the age of 16 has provided us with information without their consent, he or she should contact us using the details in the “Contact” section below. We will delete such information from our files as soon as reasonably practicable. It is unclear why a company that doesn’t want children to use their services has run a promotion to encourage children to use their services. As part of the promotion, InLinkUK paid parenting blogger Leyla Preston to write favourably about it on her Motherhood Diaries site. The Call Santa promotion has also been run in New York for the past two years, where Google’s spy kiosk service is branded as LinkNYC. Google currently has over 50 spy kiosks in London and the first one in Leeds was opened in December. BT, who have partnered with the internet surveillance giant and advertising firm Primesight, are installing over 1,000 kiosks to replace old phone boxes across major UK cities in the next few years. Planning permission for dozens more kiosks has recently been granted in Wandsworth, Lambeth and other London boroughs. 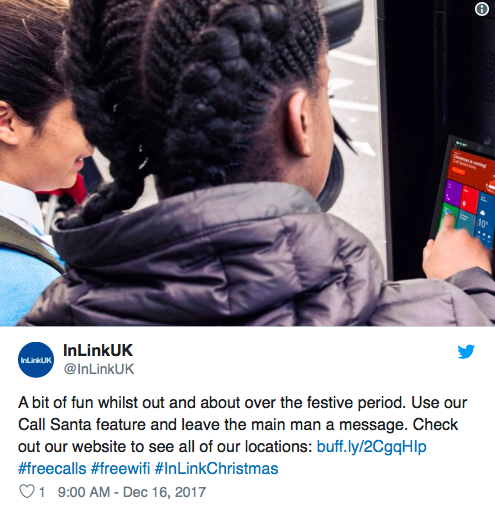 While ostensibly promoted to provide free wifi and phone calls, the InLink kiosks are part of an urban sensor grid designed to track pedestrians and vehicles. Each kiosk has three street-facing cameras and is connected to Google’s data centre by a high-speed fibre optic network. Matt Bird, general manager of InLinkUK, declined to comment. Santa didn’t return my call.